A classroom at a Gainesville, FL, research school is part of a Steelcase-funded study to find the best way to leverage physical classroom space to implement active learning initiatives. Plans are underway to build a new building for grades 6 through 12 at the P.K. Yonge Developmental Research School in Gainesville, FL. The research and laboratory school associated with the University of Florida is ready for a revamp: Students have used the same facility since 1954. Before breaking ground, however, School Director Lynda Hayes decided to start with an investigation of state-of-the-art classroom furniture. Earlier this year, the school won Steelcase Education's Active Learning Center Grant, in which the company works with schools to study how physical classroom space can be leveraged to implement active learning initiatives. Along with teachers and students at 11 other K-12 schools and universities, P.K. Yonge is participating in Steelcase study on how to intentionally design classrooms to enhance active learning. "We take our mission around research seriously," Hayes said. Before the Active Learning Center Grant, students in Eric Lemstrom's class were stuck in old-fashioned desks. Steelcase outfitted 11th-grade language arts teacher Eric Lemstrom's classroom with new furniture in time for the start of the fall semester. 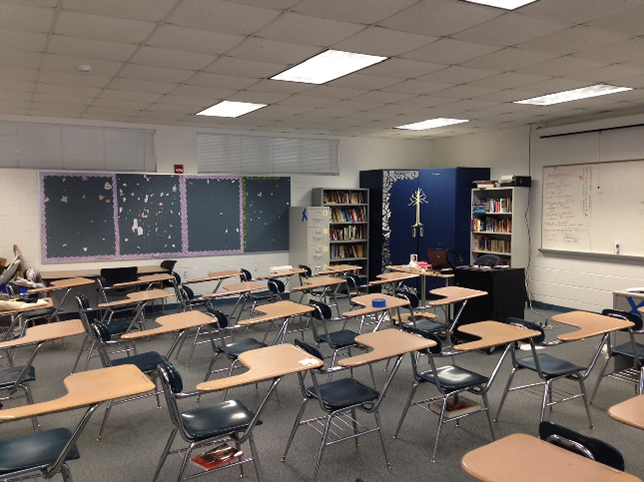 Previously, his classes of 25 to 30 students each dealt with the traditional standalone desks that not only isolated students in their desks, but were difficult to move around the carpeted room. Today, the classroom has 15 tables that can accommodate two students each. Most importantly, the tables and chairs have wheels that make it possible for Lemstrom and his students to move them around the room into different configurations — depending on what kind of activity they are involved in. The classroom also features an interactive projector and whiteboard, along with smaller 18- by 24-foot whiteboards for every student. 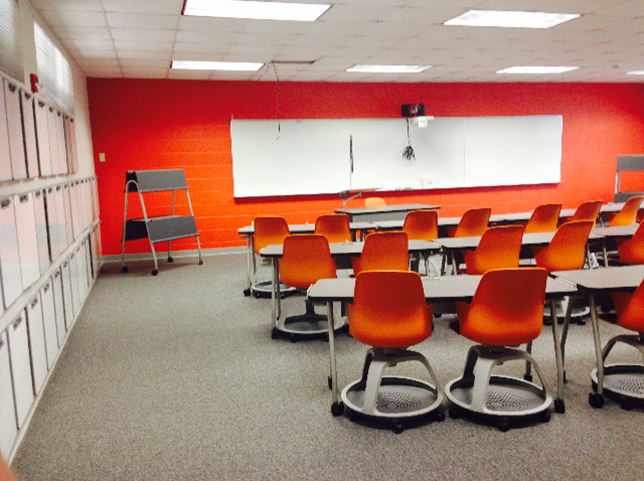 In the revamped classroom, students sit at tables that can easily be moved around the room. All this has allowed Lemstrom to experiment with different settings, since moving things around can take place in a matter of seconds. He teaches 100-minute classes and will change the room as many as four or five times during that period. The results of the Steelcase study will not be available until January, but Lemstrom already has begun to see patterns, with certain kinds of configurations more effective for some activities and other configurations for others. Another observation: "Early findings are that new furniture is highly appreciated by high school students," he said. "It makes them feel like we care about them." The other K-12 schools involved in this year's Active Learning Center Grant program are Saluda Trail Middle School in Columbus, OH; Hall Middle School in Larkspur, CA; Grover Cleveland Middle School in Caldwell, NJ; and Forest Hills Northern High School in Grand Rapids, MI.